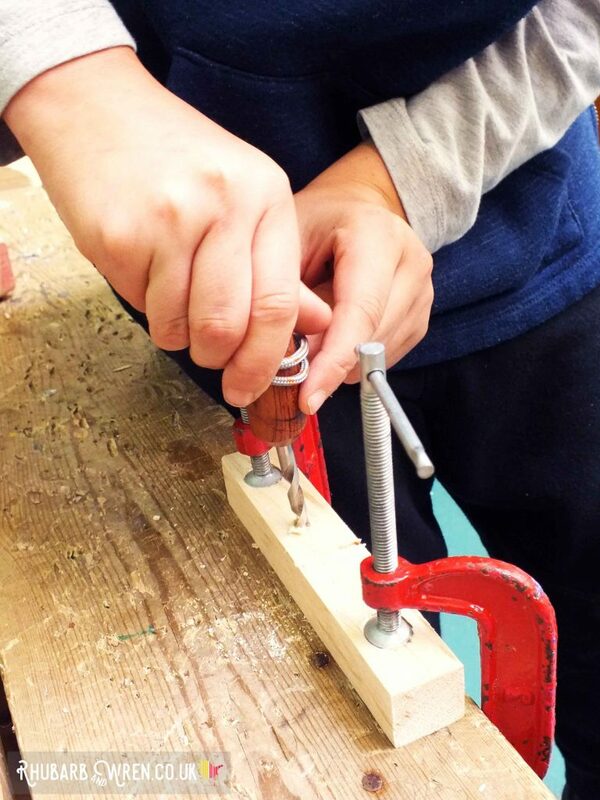 Why Use Real Tools With Kids? If you’re thinking of getting your child some toy woodworking tools, consider instead these kid-sized real tools from HABA. 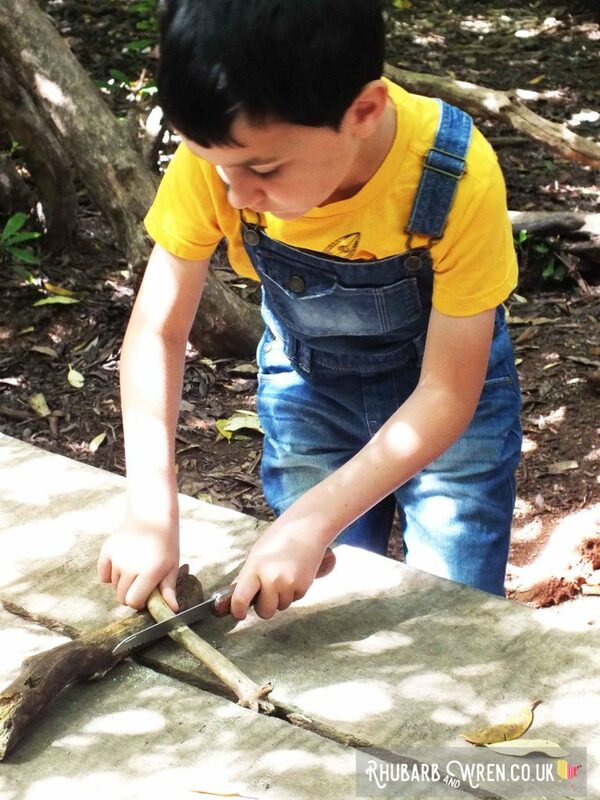 Using real tools (heavy, sharp and pointed as they may be) facilitates new skills, and enables children to accomplish real tasks, helping build their self-esteem and confidence. Woodworking also requires, by definition, natural materials, which provide a sensory experience for the kids. This helps build their understanding of the world around them in a way that just isn’t possible through pretend play. Still not convinced? 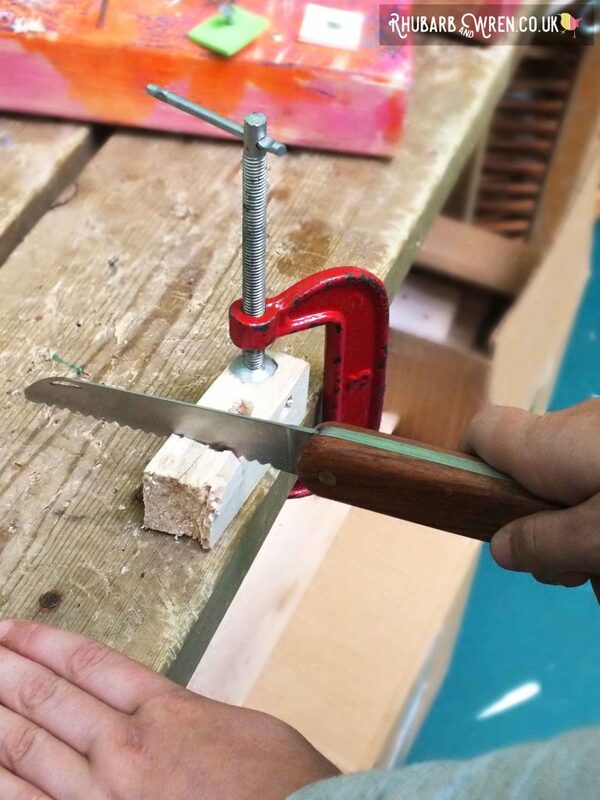 Think about it like this – when you pretend-cut something with a pretend-saw (plastic or otherwise), you mimic the motions you may have seen grown-ups do, but you don’t feel how heavy wood can be; how the colours, weight and textures of different woods can vary; how the wood smells. You don’t feel the resistance of the grain, or see, smell or feel the sawdust that your action produced, or how one piece of wood might splinter and crack, while another cut smoothly. 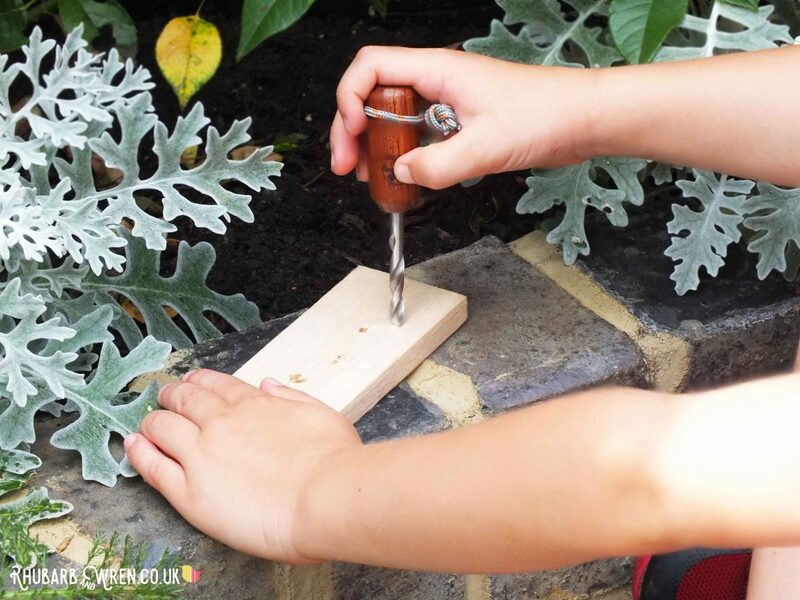 In pretend play, you won’t feel that triumph and sense of achievement when a real piece of wood is changed by your actions (even if, to a grown-up, it might seem like just cutting a branch in two, drilling holes in an offcut or hammering in a few nails). Using a brace requires concentration. 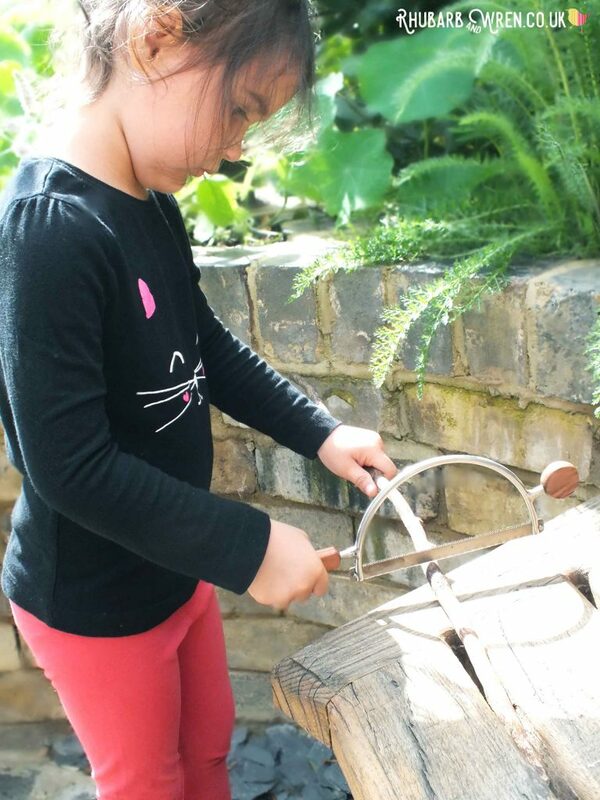 As parents many of us are understandably concerned about the safety aspect of using real tools – it can go against your every instinct to give your child something designed to be sharp or pointy or really, really heavy, never mind the benefits. And, of course, these tools do need to be handled with care and under supervision. What makes these HABA tools so great is that they are most definitely real tools – able to cut and drill and gouge – but they are also sized just right for little hands, making the tools not too big or heavy for kids to handle, which means they can handle them more safely. 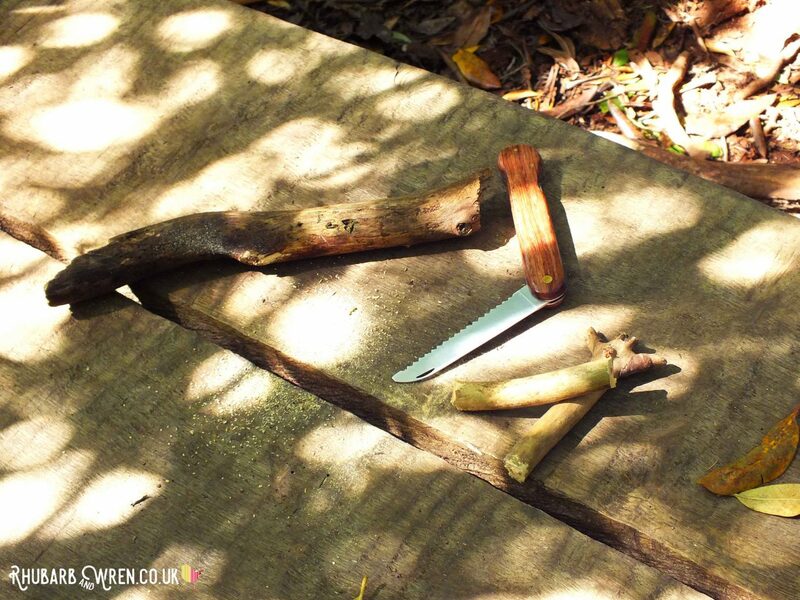 Easy to master – the pocket saw! Among the tools sent to us by One Hundred Toys were two saws – a bow saw and a folding pocket saw. These two simple tools were firm favourites with all the kids who tried them out for me. The activity of sawing requires hand strength, concentration and co-ordination – the angle you are sawing at must be maintained; the saw will occasionally snag and will have to be repositioned; just the right amount of pressure will need to be applied (and that will vary for each piece of wood being cut). Both my kids and the friend-extras I drafted in really responded to the challege of this, and I could see how excited and proud they were to be trusted with the responsibility of these tools. Being so portable is a great advantage to the HABA Terra Kids folding saw. The kids found the folding saw the easiest to handle, and it required very little instruction for them to get the hang of using it effectively. 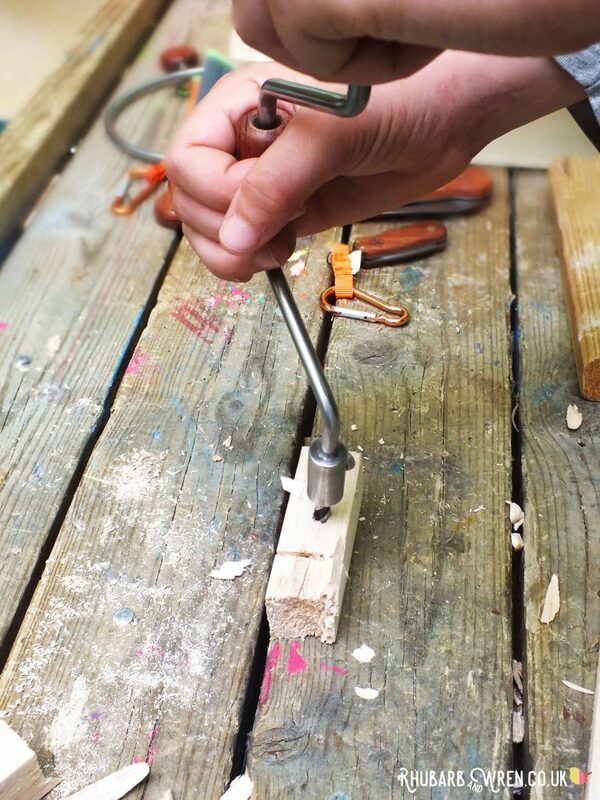 The bow saw demands a little more concentration and precision, and is harder to get into a rhythm with as you saw, as it will snag on the wood if angle or pressure are off. However I don’t think that this is a bad thing – when used properly, it works fine, and it was clear that for the kids, getting better at using it really increased their sense of accomplishment. Making holes with a gimlet. 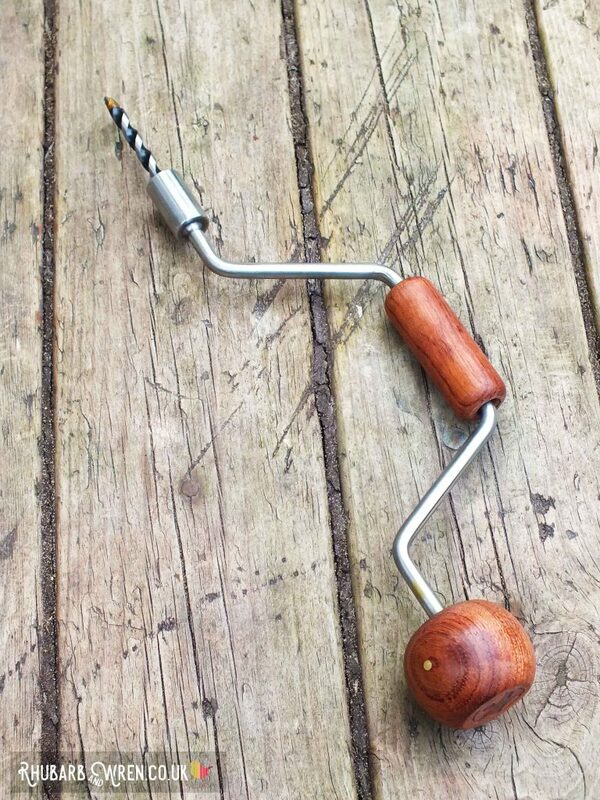 With the two drills we received, it was much the same – the gimlet, a small hand-held drill bit that you push and turn into the wood to make a pilot hole, was easy enough for the kids to grasp, while the hand brace was a little more complex to use as you have to turn the U-shaped central crank/handle to operate it. This motion takes a few goes to get right, but once the kids found the rhythm, they found it a fun and very satisfying tool to use. Using the hand brace can be tricky! 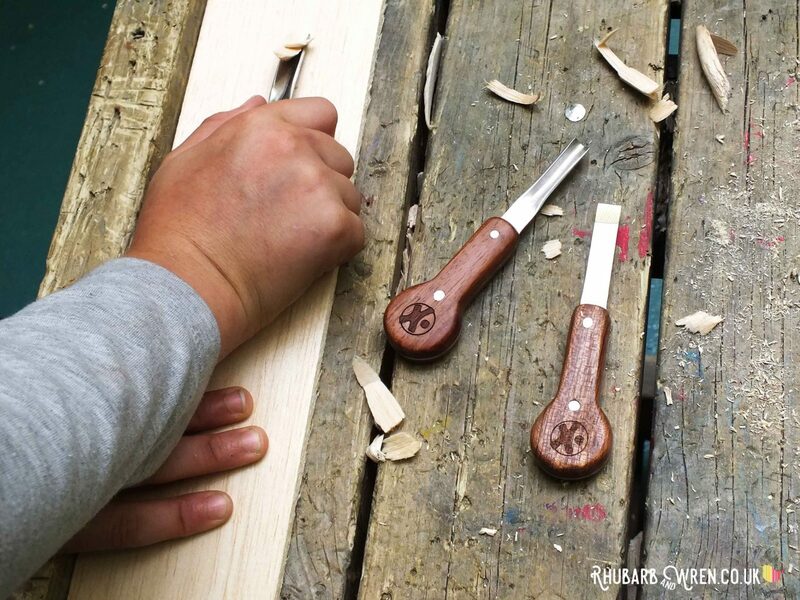 While the smaller size of these tools makes them easier for kids to use, the downside for cutting tools like the bow saw and folding saw is that their size makes them unsuitable for cutting anything particularly thick. We found they worked well with branches and sticks around a couple of centimetres thick – any bigger than this and my kids (who were aged between three and nine) got too tired to finish the job. Using these tools also strengthens hand muscles. 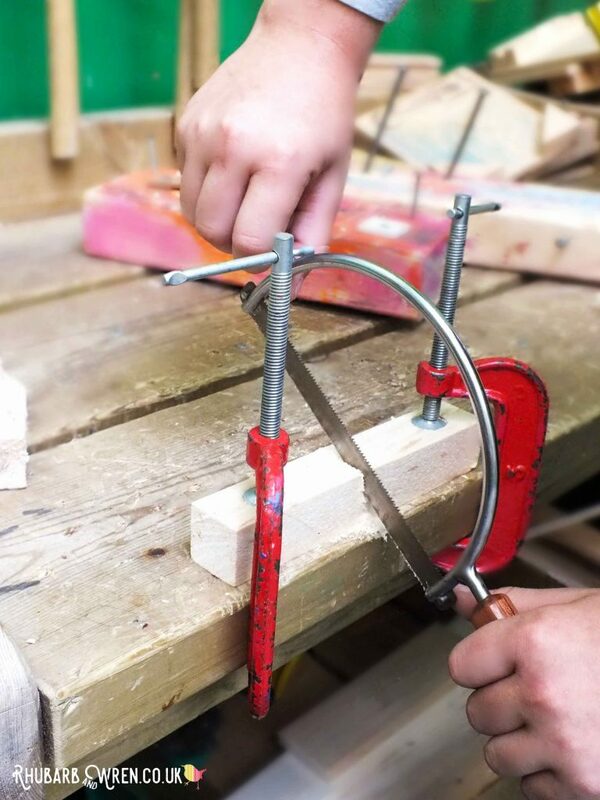 This might seem to make them a bit pointless (the kids will struggle to cut large wood slices, for example), however there are still plenty of possible applications and projects you can use them for – and all the tools come with little booklets full of ideas. 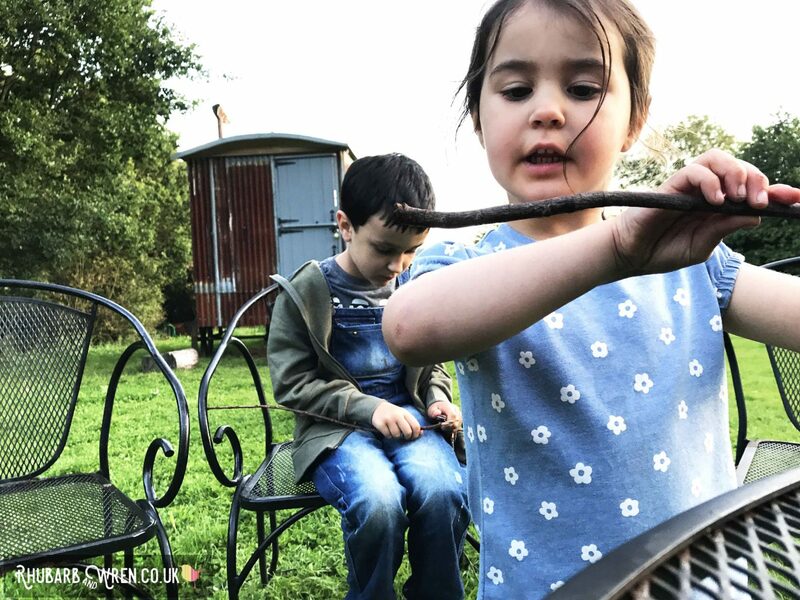 We’ve taken them along with us on outings to the woods and local orchard, where we were able to use them to cut branches to size when making wands and building dens, as just two examples. That portability is the flip side benefit of them being small. It’s a big plus, especially with the folding saw, the little penknife, and the gimlet, which can be slipped easily into a pocket to take out with you on these kinds of trips. The small size of this penknife makes it trickier for adults than kids! 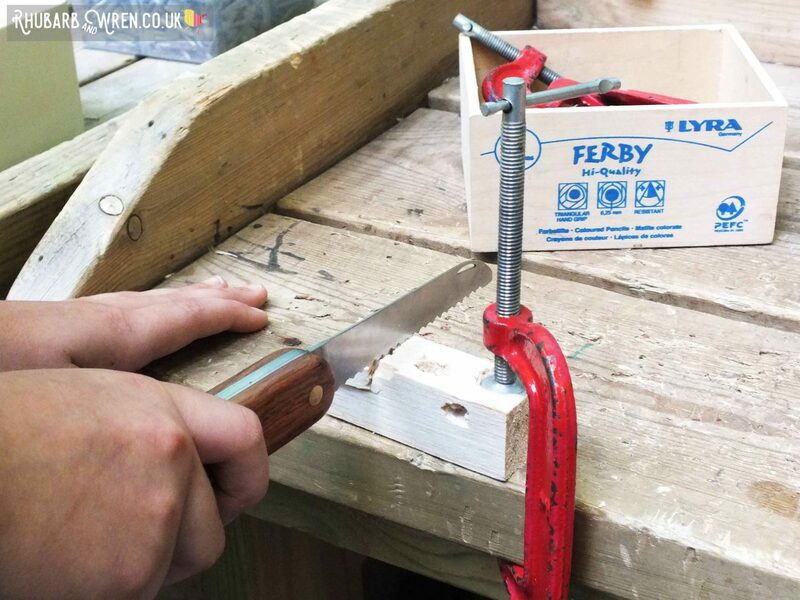 We felt spoilt for choice with all our new tools, but the penknife finally came into its own on our recent Gypsy Caravan holiday to Farrs Meadow, in Dorset. 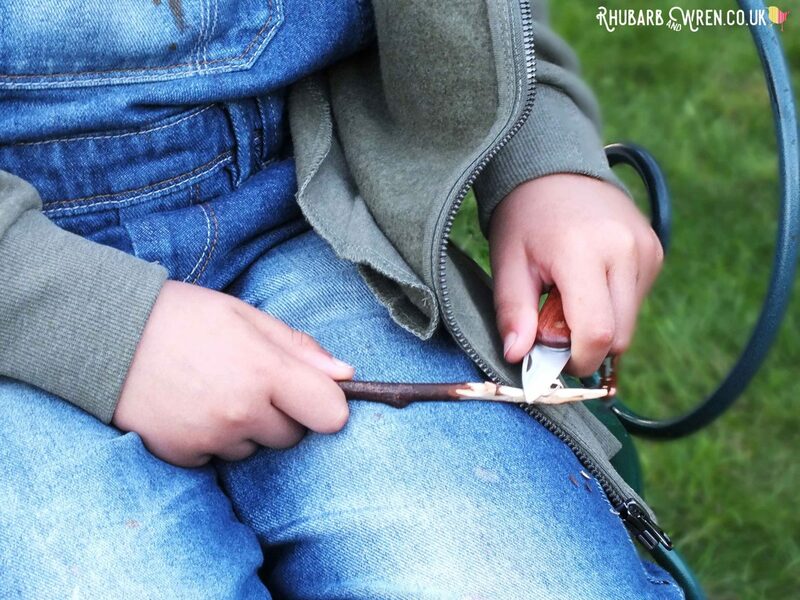 Marshmallows were required for toasting over the campfire each evening, which meant finding and sharpening toasting sticks. 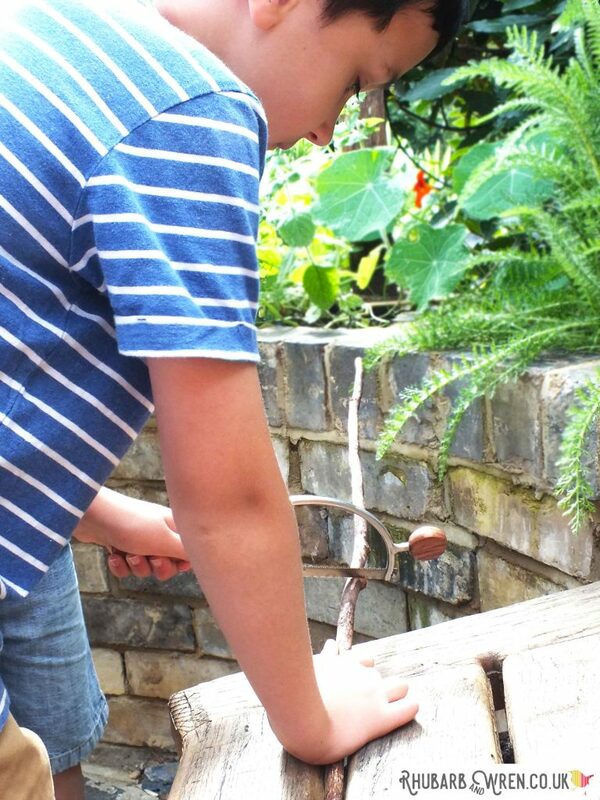 Both children adored this activity and became dab hands at sharpening the ends of their sticks. Because it’s so small, the HABA penknife can be taken on camping trips. While the bow saw is sold as an individual item, the folding saw and the penknife can both be bought either separately or as part of a carving set that also includes four gouges, sharpening stones, a tool roll to store everything in, and spoon blanks and lime wood carving blocks to start the kids off on some projects. We were thrilled to receive this set as part of the bundle One Hundred Toys sent us, and I have to say it’s a really lovely set that would make an impressive present. The set comes in a large and beautiful box (once you get the outer sleeve off! ), and inside the tools are presented in three separate layers – the contents just seem to go on and on! 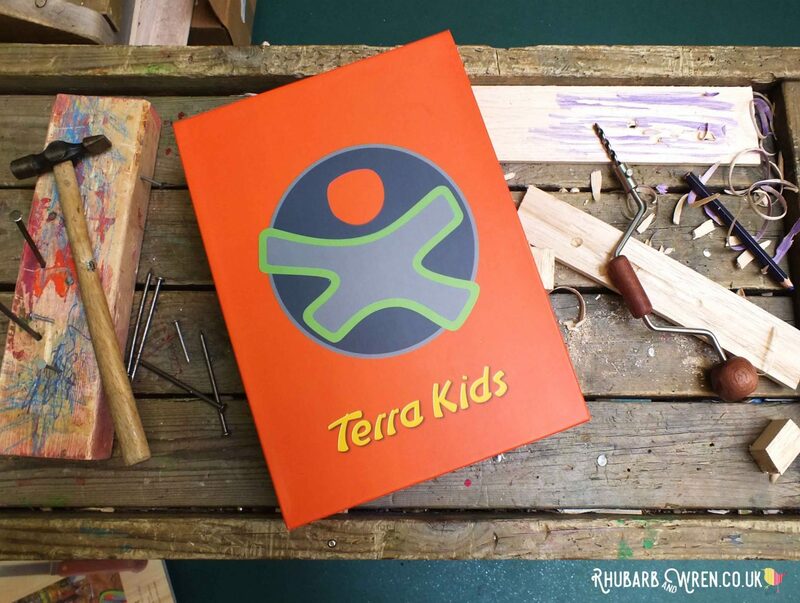 Underneath the outer sleeve is this gorgeous box for the HABA Terra Kids carving set. I restricted use of the gouges mostly to the older kids (seven and above), as I felt less comfortable with the younger ones managing the task of both holding the wood safely and directing the cutting edge without sending it skidding off (as a hobbyist lino-cutter, I’ve done just that myself many times!). This probably says more about my nerves than the ability of the kids, and I will have a go at some point with my youngest when the moment feels right – probably on some lino rather than wood, as she’s fascinated with that process and often helps me make prints. Practicing on balsa wood is not only cheap but also easier to carve, helping to build confidence. 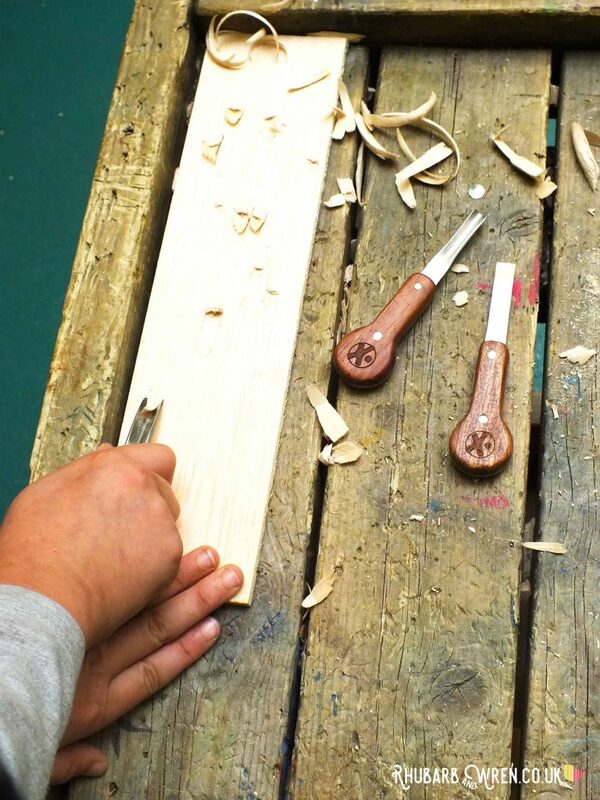 The older kids loved using these gouges – I started them off by practicing on some soft balsa (you can pick this up cheaply very easily), just making lines in the wood. After trying this out, we talked about how they could vary the depth and the patterns by varying the angle or using the different shaped gouges. When surface carving (for woodblock printing, for example), it’s easier to easier to see what you’ve carved when the top layer of wood is a distinctly different colour, so the boys shaded the blocks with coloured pencil and experimented by gouging spots and patterns. Different shaped gouges produce different marks. Colouring the wood to see your marks easily. ​The gouges can cut clean lines but as they are fairly large V and U shapes, they aren’t great at detail work when used for print block making. However they were a good size for the kids to hold, and worked well at shaping the soft wood. 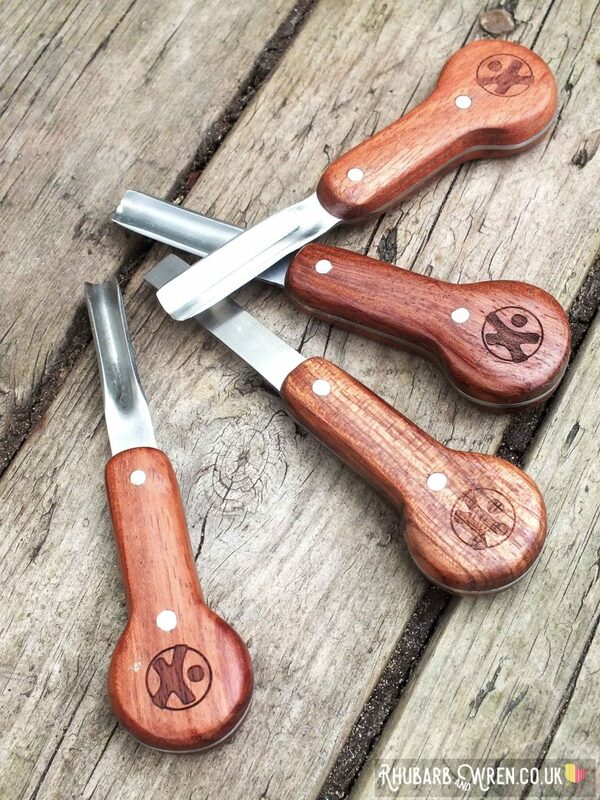 They made great whittling tools (which, to be fair, is how they are marketed!) and were good starter tools for children to try out block printing. It was also an unexpected bonus to find they came with three grades of sharpening stones to keep them sharp – it might seem illogical, but a sharp tool that cuts smoothly and easily is much safer than a blunt tool that takes force to use. Each gouge has a different shape. Short handles make these ergonomic for young hands. The tools also come with excellent safety guards for protection against sharp edges and points in storage and when transported. The bow saw, for example, has a wrap-around Velcro guard for the blade, made out of tough neoprene fabric thick enough to completely cushion it even when I pressed my finger hard against the cutting edge (yes, I was that kind of child). 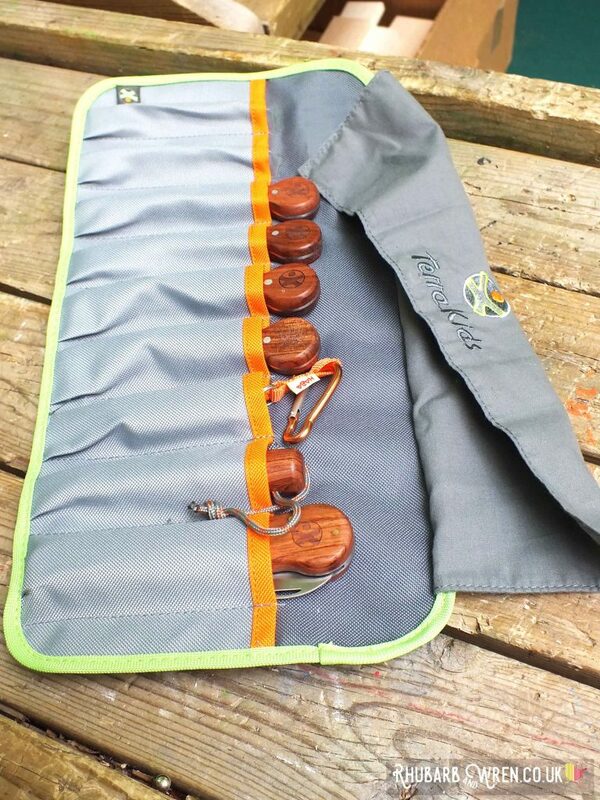 It also has a snap hook for storing and transporting safely. The tool roll for the gouges is made of the same stuff and keeps their pointy ends safely tucked away. The blade of the folding saw tucks safely away into its handle (just like the penknife), while the gimlet drill has a thick plastic cap for the point. HABA’s Terra Kids carving set tool roll. The bow saw blade is well protected. One of the many things I love about these tools is that they look so gorgeous and are solidly made out of quality materials – these definitely look and feel ‘real’. This comes back to one of reasons why educators often recommend non-plastic items for kids – the beauty of these items gives them a prestige that is apparent even to children, and to be able to own, hold and use beautiful tools adds to their own sense of and self-worth. It’s an idea that underpins educational approaches like Montessori and Reggio Emilia, and one of the reasons educational establishments using those methods place such importance on non-plastic materials and ‘real’ tools in their learning environments. 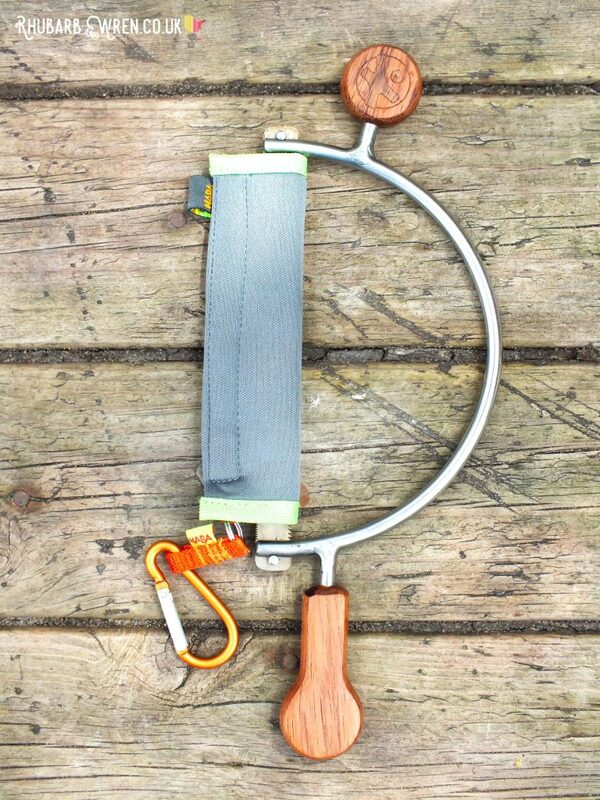 HABA’s pocket saw is small yet mighty! ​And yes, safety has to be a consideration when you are using real tools with young children, but it shouldn’t be a discouragement either. I have been so impressed with the maturity all the kids have shown when given the chance to use these tools, and I think that my son put it best when he said the reason he enjoys using them so much is that, in his words, it’s more fun doing the real thing rather than just pretend. These HABA tools make it that little bit easier and safer for them to master these skills, and I can see them providing years of enjoyment – and usefulness too! Cutting wood in the woods! Kids will happily spend hours woodworking. 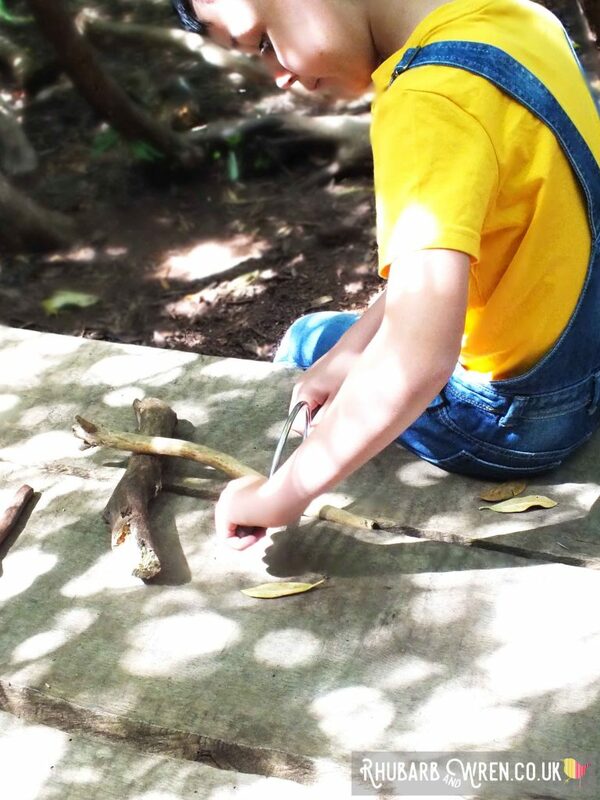 If you’d like to read more about the whys and hows of introducing woodwork and real tools to young children, I highly recommend reading the in-depth article by Peter Moorehouse – Woodwork in Early Years. 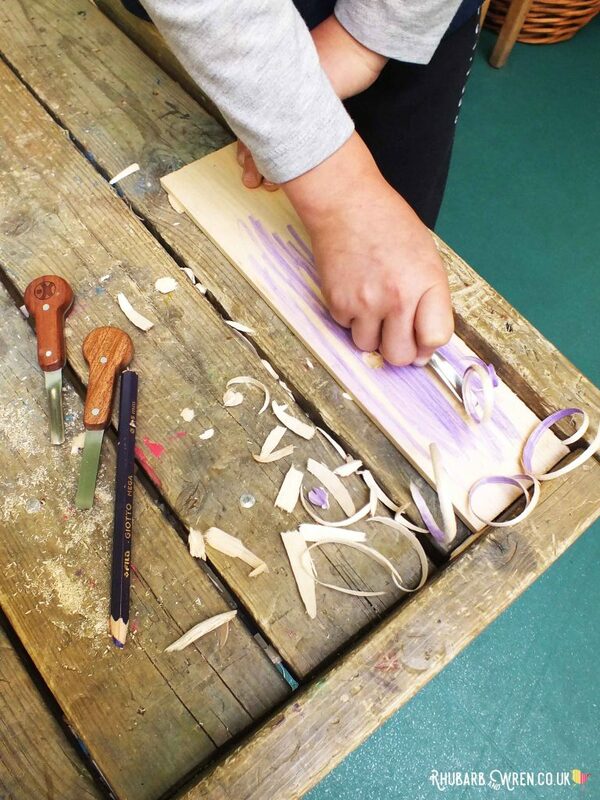 Peter is an Early Years practitioner and an artist, who specialises in woodwork with children. Though his piece is written primarily for teachers and teaching environments, there’s a wealth of ideas and information that’s just as useful for us parents. Den making is much easier when you can trim the branches! We were very grateful to receive these tools from One Hundred Toys for the purpose of this review. All opinions in the review are our own. If you’re looking to buy HABA tools like the ones reviewed here, check out One Hundred Toys ‘Outdoor Toys’ selection, or find them under ‘Haba’ for everything by that brand. One Hundred Toys is an online toyshop, based in the UK. ​Their ethos is to provide a carefully curated collection of the one hundred essential toys, games and DIY things-to-do that will engage and delight your child. The website also includes lots of free activity ideas and a great blog, so check them out at www.onehundredtoys.com. We love making mini dens for forest creatures – or pocket companions! Mini dens are an easy way for kids to learn den building skills that can then be used to build one big enough for them. Click through to see some of the different types of den they can make. How to conquer playing the traditional childhood game of Conkers! 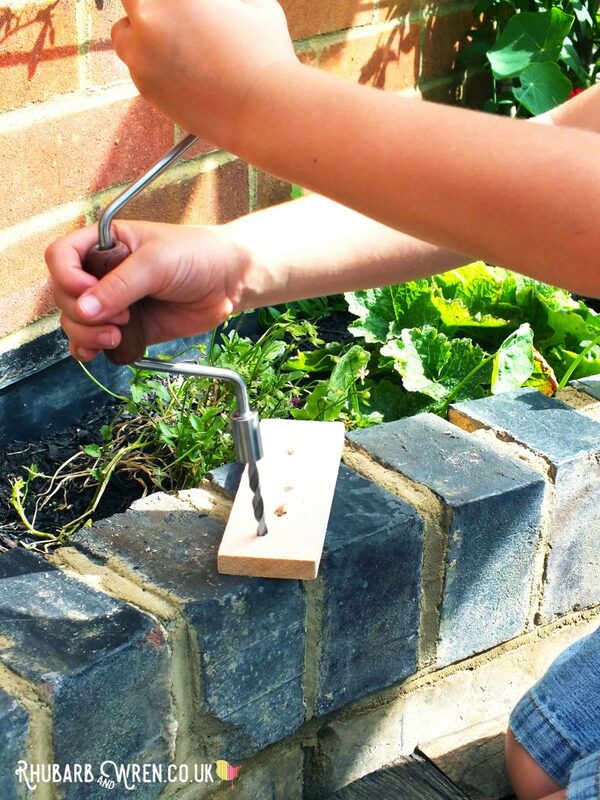 And yes, real tools are involved in this one too – check out our fabulous conker drills which turns making holes in your conkers into a piece of cake. 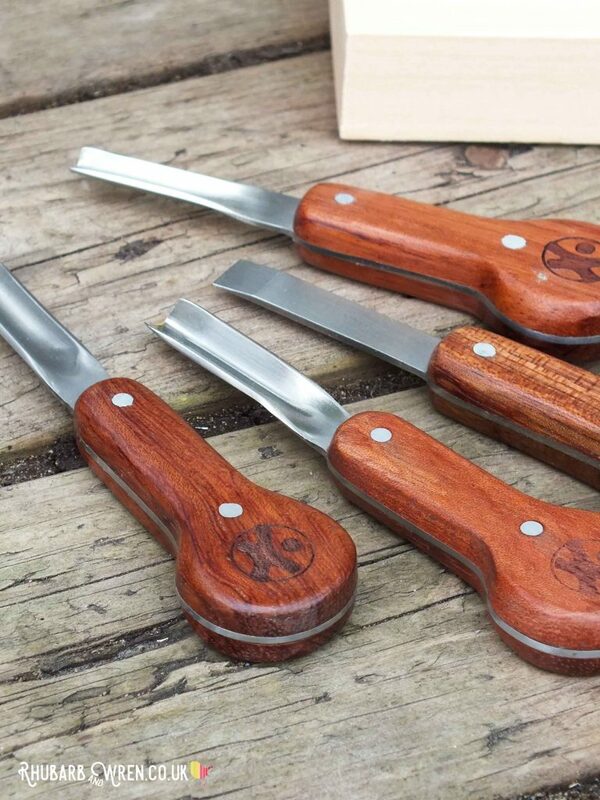 Haba’s ‘Terra Kids’ folding saw is perfect for taking to forest school. Craft, Educational Toys, Essential Toys, HABA, Learning Through Play, Nature, One Hundred Toys, Preschool Activities, STEAM, Woodworking. Bookmark. I definitely needed to brush up my own skills – it’s been a while! I can see the kids are really enjoying this activity. Good they are learning to do this. This looks like a lot of fun! I think my son would enjoy it. 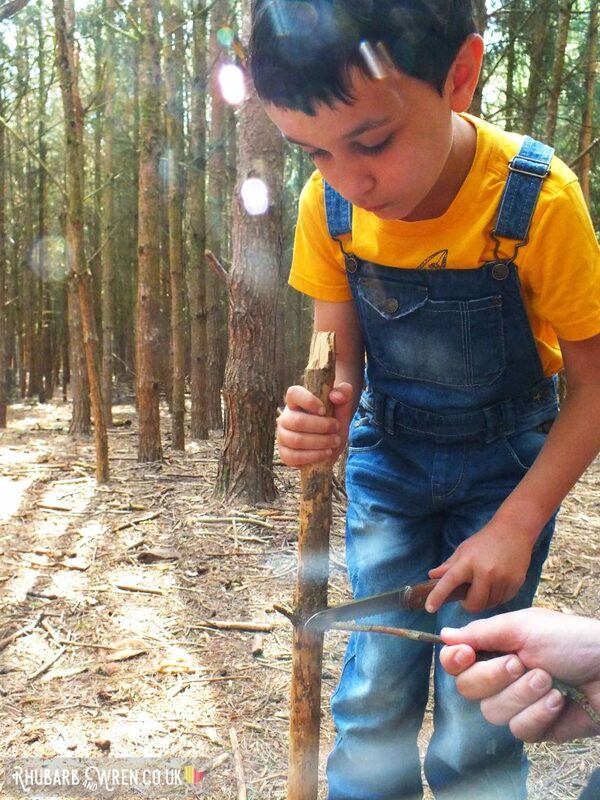 I only heard of Forest schools a few weeks ago and think they are amazing. I absolutely love the idea of these toys and feel that it is all about the supervision. Having tools the correct size that hey can hold is perfect too. 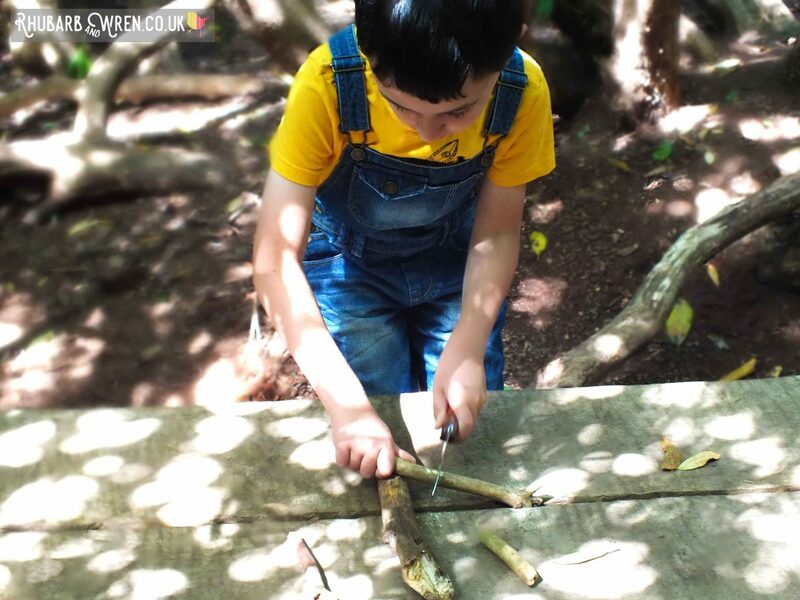 I’m such a huge fan of forest schools – and these are just the sort of activity they do with the kids! I absolutely loved using tools like these at school. Love that you can get a selection like this for young hands. I think with some supervision the kids can do great things especially since they would have kid sized real tools to work with. How ingenious. Thanks Cath – the kids got such a lot out of these activities, and it doesn’t take much to get them started… a few twigs and a saw would do it!